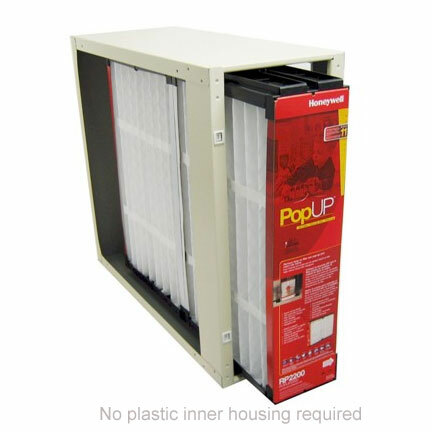 The PopUPT revolutionizes air filtration with a design that self-assembles to drastically reduce installation time and the messiness of replacement, while maintaining a highly efficient MERV 11 air-filtration rating. When maintenance is required, just remove, collapse and dispose of the entire filter - no more seperate parts (pleat combs, inner frames) needed! * Replaces Aprilaire / Space-Gard part # 201, Lennox PMAC20 Filters, and Generalire AC-1. * Quick, easy maintenance. Preassembled filter is replaced with just one piece - the filter - making simple homeowner maintenance. 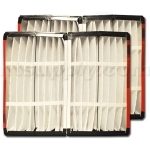 * Additional 1" inch filtration provides more surface area for higher efficiency air filtration. * Universal fit. PopUP is available in six sizes, compatible with all Honeywell and most competitive MACs. Dimensions (in.) - 20 1/4 in. x 24 1/4 in. x 5 7/8 in. Efficiency- Standard Efficiency ranges are defined for small particles, E1=0.3 to 1.0 microns; medium particles, E2=1.0 to 3.0 microns; and large particles, E3=3.0 to 10.0 microns. Efficiency - Standard Efficiency ratings are based on American Society of Heating, Refrigerating and Air-Conditioning Engineers Standard 52.2-1999. Note: This product is not manufactured or distributed by Research Products Corporation, owner of the registered trademark Aprilaire®.